Leading-edge security for an unwired workplace. 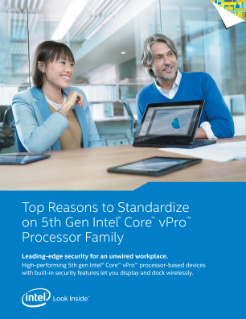 High-performing 5th gen Intel® Core™ vPro™ processor-based devices with built-in security features that let you display and dock wirelessly. Meet the mobility needs of your users, and the security requirements of your business. A no-compromise design delivers the right PC for any user or business. Stop searching for dongles and ...adapters, and start sharing instantly with wireless display. Uninterrupted productivity ensures you are connected and ready, the moment you walk up to your desk. Protect your sensitive business information, wherever it may go. Wired, wireless, at your desk or on the go, device management is always available no matter what the device or location. Hardware-strength protection meets up with usernames and passwords. Safeguard the enterprise, while users display and dock without wires.